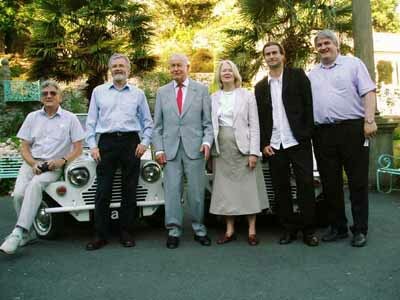 On Sunday 7th August 2005, the largest "Prisoner" event since the mid-1990s took place when a sell-out crowd gathered in Portmeirion for PM2005 - a one-day celebration of Patrick McGoohan, "Danger Man", "The Prisoner", and Portmeirion in aid of Ty Gobaith Children's Hospice. The event, co-organised by The Unmutual Website and PrizBiz, was held with the kind permission of Portmeirion and Granada Media at the Hercules Hall in our favourite village. A packed programme of events, including screenings of rare items, special guest interviews, a guided tour, mini moke rides, a raffle, quiz, displays and auction all took place without a hitch. We are delighted to announce that we managed to raise £1042.48 for the charity, and reports are coming in from attendees that a great time was had by all. Peter Graham Scott (Director), Eric Mival (Music Editor), John S Smith (Film Editor) and Robert Fairclough (TV historian) were our special guests for the event, and each gave fascinating interviews and also provided a live commentary to the episode "The General", as well as sparing the time to pose for photographs and sign autographs throughout the day. A full report of the event, including many photographs supplied by event photographer Nick Bennett and others, is online HERE. Thanks to everyone who attended or supported this independent event!